Experience the magic of Ireland with Celtic Thunder! This second-to-none stage show comes to Benedum Center on Sunday 16th September 2018, invoking the mystical atmosphere of the Emerald Isle with phenomenal stage sets, incredible visuals and some of the hottest vocal talent this side of the Atlantic! 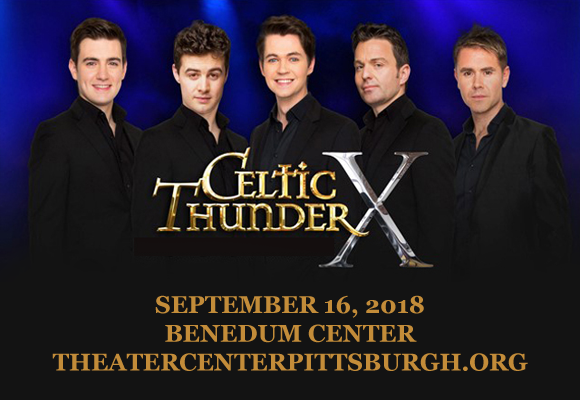 Celebrating ten years on the stage with the X Tour, fans can enjoy performances of hit songs from previous PBS shows including Legacy, Mythology, Voyage, The Show and It’s Entertainment, so don’t miss your chance to see Damian, Ryan, Emmet, Neil and Michael live! Conceived by Sharon Browne and written and arranged by Phil Coulter, Celtic Thunder is a stage show like no other! Taking the audience on a journey to mystical Ireland, this multi-platinum-selling a capella group combines comedy, drama and dynamic choreography with unparalleled vocal talent, creating a spellbinding atmosphere. Backed by incredible musicians, and with top-of-the-range lighting effects and stunning stage sets, Celtic Thunder pulls out all the stops, creating a unique and special experience that will leave you breathless!